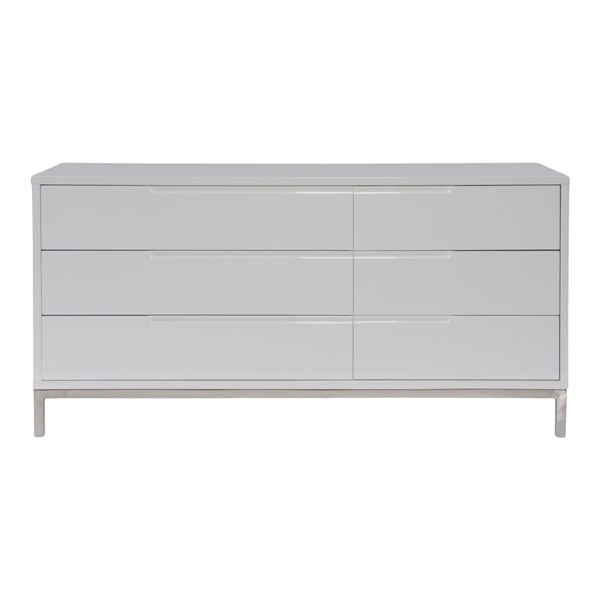 If sharp and sleek is your kind of storage style, then set your sights on the Naples Dresser by Moe’s Home. Featuring a crisp, clean-lined contemporary design with a distinctly industrial edge, Moe’s Naples Dresser offers ample organization space in its six generous drawers. Standing on stable legs of strong stainless steel is durable MDF construction in a smooth and neutral gray finish that is easy to incorporate into all manner of modern motifs, whether on its own or along with other Naples pieces by Moe’s Home. Crisp contemporary design with industrial edge. Expert construction of durable MDF. Durable finish of neutral grey. Brushed stainless steel legs for stability and shine. Complements other pieces from Moe’s Naples collection.